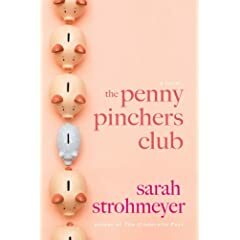 I had the pleasure of reading Sarah Strohmeyer’s The Penny Pinchers Club and I really enjoyed it! It is an uplifter in this low economy environment. Drastic times call for drastic measures. Kat starts by cancelling cable and kicking her $240 monthly Starbucks habit. But what starts out as a simple effort to cut coss soon becomes an over-the-top obsession when she joins an eclectic but loveable group of savers called the Penny Pincher’s Club. It is a fun book (she even goes dumpster diving)! Blog about this giveaway or put my button on your blog! I will find the winner using random.org on Tuesday July 20th. Good luck! The craziest thing I've done to save money is regifting. The craziest thing I have done to save money…I guess barter, or try to recreate something myself. The best deal I have gotten lately was a tag reader book for $1. The best deal I ever got was Farmland Bacon which was on sale for $2 a lb package and I had 50 $2 coupons-so free bacon-yeah! The best deal I ever got was the entire month of October in 2007. CVS had awesome ECB that month. I still haven't used all the shampoo and bodywash I got free. It was over a year before I had to buy any sanitary items. Probably the craziest thing I ever did was back in the days when I used to be real big on refunding. It got so bad that my daughter (who was only 3) wouldn't let anyone throw anything away without cutting off the UPC code first. Hold on… a $240/month Starbuck's habit? That leads to a huge dent in the budget for coffee, doesn't it? Unbelievable. That's less than we paid for our car insurance premium, and would be a good chunk of our food budget! I drove 40 miles to get to a great garage sale – and it was totally worth the gas money! The best deals I get are those free / get paid to buy it deals at CVS. Thanksgiving shopping there last year was a blast! The craziest thing I have ever done to save money is get up at 4am so that I could be to Walmart at 5am for their Christmas DOORBUSTER sale! The worst part?! I dragged my poor husband with me! I wanted a new computer and I wanted him to help me get it out of the store . . . now THAT is true love! The best deal I ever found was a signing up for a free trial with GREAT FUN. You get a bunch of discounts, etc. etc.- but I was supposed to get a $20 Am Express gift card if I would try them for $1 for 30 days. I sent in my claim card to get the $20 gift card and after 4 weeks I still didn't have it. So I emailed them and told them I never got my gift card. Well, only a few days passed and I got my $20 gift card. THEN- about 6 weeks later I got ANOTHER $20 gift card from them and about a week after that I got ANOTHER $20 gift card from them! All of this AFTER I had cancelled my free trial membership after the 30 days. I don't know what happened in their system that I got the extra cards twice- but it was a pretty sweet deal! I think I do crazy things all day to save money! My family would probably say it is that I won't turn the AC on. One thing I love is getting free magazine subscriptions. I have a google alert set to "free magazine subscription" so I can get them often! The best deal I have found is on kids clothes. I love to buy name brand items dirt cheap. Just yesterday I bought my son an outfit from GAP for $10! That was jeans and a tee! Previous post: The Children’s Place Clearance – Deal of the Day!